First off, the finish here is not the black of the production model. Instead, Gibson tell us this is ‘Angus Cherry’. We all love a cherry Gibson and this one is apparently designed by Angus himself. It’s a little darker and, we think, slightly browner than a regular cherry. It looks quite smart, especially with the supplied hardware (more of which later). As you’d expect, we have a mahogany body and neck and the fingerboard, in common with the whole Angus range, is ebony. 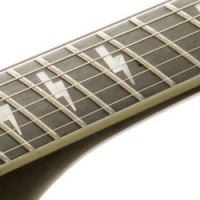 The lightning bolt position inlays are actual pearl this time and are two-piece. They’re also a bit bigger than those on the production model. Neck binding is a much more restrained off-white affair and looks much better than the orange of the ‘antiqued’ production binding. The nut, in this case, is different too – here we have a proper bone nut. As you’d expect, we’ve got 22 frets installed in a 12″ radiused board. Nothing controversial there. Again the profile and dimensions of the board have been cut to specifications taken from Angus’ own ’68 SG Standard. A deviation from the norm is the inclusion of two Seymour Duncan Pearly Gates pickups and we’re told that the bridge unit is wound slightly hotter than normal for increased output. The Pearly Gates are great pickups and I’ve used them in more than one guitar. I’m slightly surprised to see them here and wonder at the impression left by their installation – this guitar is the top of the Angus range and it’s fitted with non-Gibson pickups. Still, I’m not complaining. If I were asked to pick, these are what I’d have chosen. Another surprise here is the bridge. At first glance, we have a standard ABR-1 tun-o-matic. Take a closer look however and you’ll see that it’s installed with nylon saddles. This isn’t unprecedented but it is unexpected. 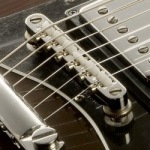 Rather oddly too, the bridge is a nickel-plated unit, while the stop-tailpiece is chrome plated. Pickguard is three-ply (B/W/B) and is the larger, 3/4 style of the late ’60s SGs. Again the control knobs are those pretty cool ‘witch’s hat’ style that always look great. Another deviation from the production model is that the traditional-style Kluson tuners have been replaced here with Schaller style units. While it could be argued that these are more stable than the others, they definitely don’t look as good. Personally, I’d have stuck with the Klusons – Schallers always look bulky on SG’s. Regarding the controls, you get the usual two volumes and tones but, in keeping with Angus’ own SG, the tone controls are bypassed and do nothing but provide somewhere to pop the witch’s hat knobs. Of course this is easy to remedy if you fancy a bit more control over you sound. These are Custom Shop guitars with a limited run and they have a price that proves this. The run is limited to 250 guitars. Of these, 200 will be VOS models and 50 will receive special treatment. These latter 50 will be ‘aged’ by Gibson and will be signed by Angus himself. Expect one of the 200 to cost in the region of $6100 while the extra special ones will cost around $9400. Check out Gibson for more. Let there be more rock.